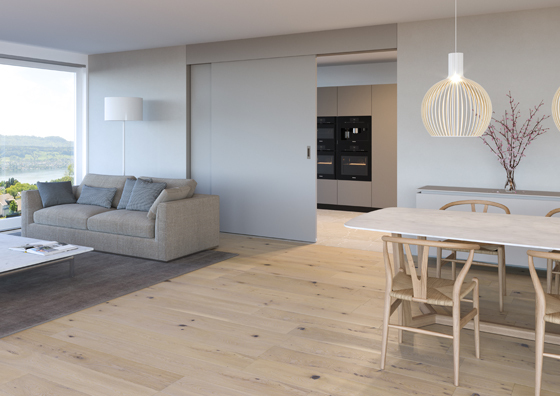 The perennially popular open-plan interior appeals for allowing natural light to permeate a house or apartment and for making it feel more spacious. Multifunctional rooms that amalgamated all reception rooms first emerged in the late 19th century. But even radically open-plan spaces – espoused by Frank Lloyd Wright and modernist architects in the 1930s – sometimes incorporated sliding doors. Sliding doors and partitions, of course, bring an almost immeasurable number of practical advantages to both domestic and office environments: room-dividing doors provide more privacy and reduce the unwelcome transmission of sounds, smells, draughts and dust from room to room. Naturally, sliding doors are also space-saving compared with conventional doors that open into a room. At the vanguard of sliding-door technology and aesthetics is Swiss-based manufacturer Hawa Sliding Solutions. Over the years, it has perfected sliding-door fittings on both technical and aesthetic fronts, recently introducing its HAWA Suono soundproofing system that can be incorporated into coordinated sliding doors and frames. Another historical comparison that might be drawn here is the classic Japanese house, which traditionally allows layouts in a home to be reconfigured using two types of sliding wood or paper doors called fusuma or shōji. Of course, shōji doors have limitations. 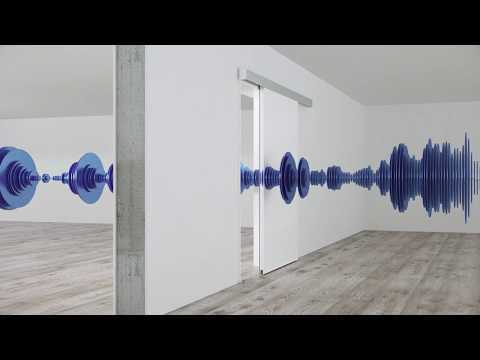 Often made of a wafer-thin material, these allow unwanted sounds to penetrate them, but, when sliding doors come with the HAWA Suono fitting system, they follow the same principle of flexibility yet also soundproof rooms. For architects, sliding doors, when closed, demarcate rooms to emphasise their more usual function, separating them unambiguously into bedrooms, bathrooms, kitchens and living rooms. 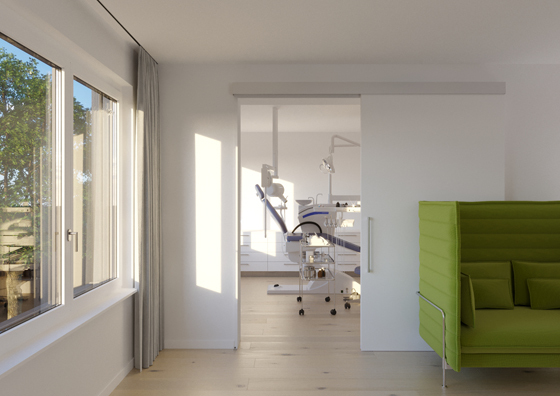 Soundproofing is clearly an important aspect of this and, thanks to the sliding doors featuring the HAWA Suono system, when its doors are firmly closed they are flush to the door frame while making full contact with the floor, thereby hermetically sealing and soundproofing the spaces on either side. An innovative, patented hardware system, incorporating a rubber seal between the sliding doors and all surfaces they touch, guarantees soundproofing of up to 39 decibels. It’s not hard to grasp the applications for these in a domestic context: think how smells and noise that normally emanate from a kitchen might be prevented from invading a living room – an especially welcome feature for a host entertaining guests? 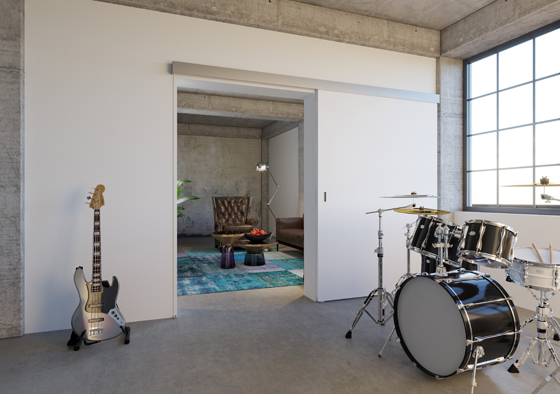 Or how about such doors installed in a music room which, when family members happen to be practising on drum kits or even rehearsing for a gig, can be closed off, leaving others in neighbouring rooms undisturbed. Alternatively, when entirely open, sliding doors create liberatingly fluid, comparatively multifunctional spaces that feel more contemporary and informal. Living rooms, as we know, are increasingly morphing into home offices and dining areas and even incorporating open-plan kitchens where hosts or parents are perfectly happy for guests and family members to see them prepare and cook food – not unlike chefs in open kitchens cooking in full view of diners in a restaurant. Another option is to leave doors partially open, creating intriguing glimpses of adjoining rooms. Other key attractions of the sliding doors fitted with the HAWA Suono system is their pared-down, neutral aesthetic and unobtrusive nature – thanks to their seamless connection within doorframe and floor – which renders them adaptable to all styles of interior, from the minimalist to the more classical. A home can look much larger when a succession of interlinked rooms with sliding doors boasting the HAWA Suono sytem are left open. 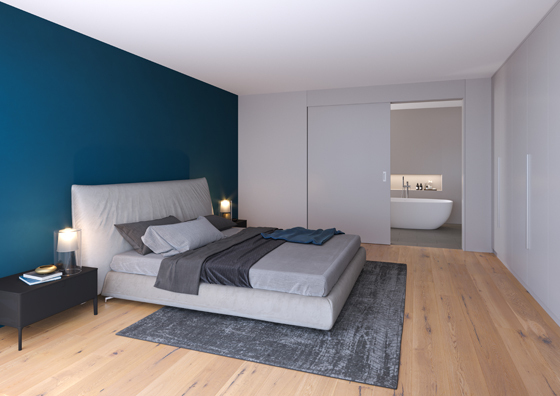 This sense of a large, open space is enhanced when the rooms’ walls are the same colour or the type of flooring used is the same throughout, to unifying effect. Windows or skylights in adjoining rooms flood homes with light. Or in rooms painted different colours, an open or partially open door creates an enticing frame that draws the eye to spaces with a contrasting atmosphere beyond them. In a matter of moments, and with consummate ease, sliding doors fitted with the HAWA Suono fitting system reveal a different environment within one’s home – or, conversely, when shut, cocoon the user in a self-contained space with its own distinct, personal atmosphere. Ultimately, Hawa Sliding Solutions offers a sliding scale of options.